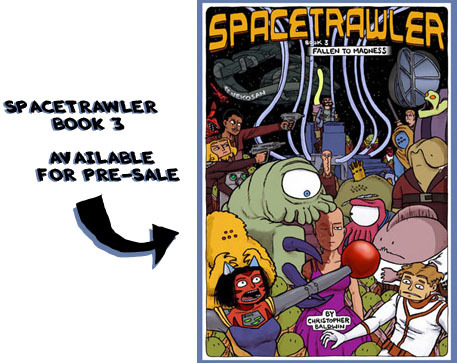 So, yes, the Spacetrawler Kickstarter is in the long home stretch. We have this week and next week left (through next Wednesday), so let’s go! 20k – for everyone who supports at least at a $20 level, you will get a Dustin “chick tract” zine. Dustin “pens it post-spacetraveling” about what’s really out there (from his perspective) to the skeptics of earth. —-> ACHIEVED! 25k – for everyone who supports at least at a $20 level, you will get a full-color “how to survive being shanghaied into space booklet” penned (and with pictures) from various members of the cast. 30k – I will extend creating Spacetrawler, by postponing the next project and doing an additional standalone Spacetrawler storyline, lasting 3 months/24 strips. But if I don’t reach ANY of these goals, know that I’m already more than happy with the enthusiasm and generosity you all have shown. You’ve all have been incredibly supportive, and this Kickstarter has already been a great success. Annnnnd, when you’re not supporting me, there are a few other Kickstarters which look mighty nice. Bill Barnes and Jeff Zugale have one for their comic Not Invented Here. Tom Dell’Aringa has one for his comic Marooned. Gini Koch is part of one for an anthology, Clockwork Universe: Steampunk vs. Aliens. And of course Marina Abramovic is doing one to fund the creation of the Marina Abramovic Institute. I really love how much Mr. Martina’s Dad’s Head has grown throughout the years. It did hit home. 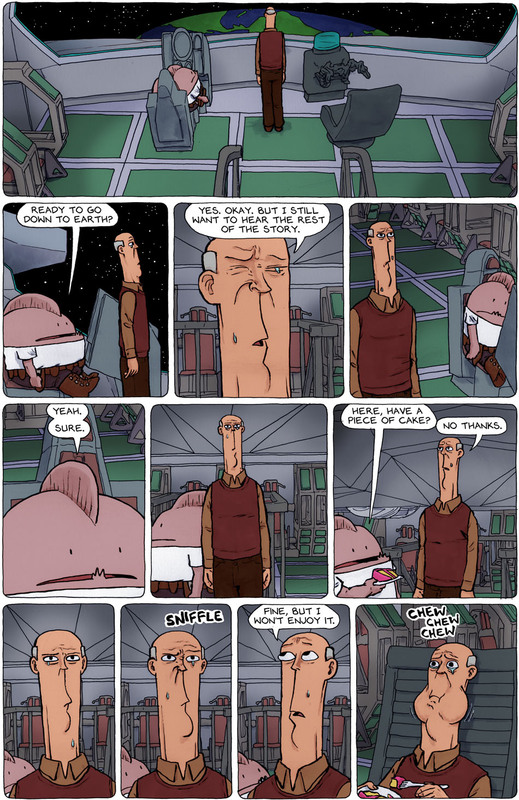 I cried more after this than after the last strip. I laughed so much when we first met Mr Zorilla scarfing down cake. As sad as it is; I think it’s kind of beautiful how you brought it full circle, Christopher. @Selena, now I feel like a bad person. I read this and I only craved cake. Oh my god, I’m literally crying and laughing at the same time. @Filipe, I’m with you. Anyone want to hazard a guess as to what kind of cake Mr. Zorilla is weeping into? Vanilla creme with puceberry frosting? I’m a terrible person. I laughed when at the last two panels. I want a mug of the last panel. Or to have it painted on a set of dessert plates. In the first panel, Earth should have some clouds, like in the second installment of Spacetrawler from 3 years ago. It might just be me/a stylistic choice, but I find the “chew chew chew” sound effects to be a little… distracting(?) in the last panel. Not sure how to describe it, but I feel like it’d be better left wordless. Just my opinion, of course. If you were looking to create a sad moment then this one is a win. I love how the tears have sooooooo far to go as they roll down his headneck. Drown you sorrows in sugar. My heart still hurts…and now I want cake but don’t have any. Damn you Chris. @Selena, you pretty much said everything I was thinking/feeling. I’ve actually been dreading reading this strip the last few weeks even though I want to know what happens…and I can’t laugh at the last panel because unfortunately, I know exactly what that’s like. It just breaks my heart in little pieces. Chris, you are a beautifully talented storyteller (even though all your strips make me cry at the end!). Thank you so much for sharing your gift with us. While chewing in this picture he either looks like a guppy or maybe a bit like Choan. Okay, am I the only one weird enough to have flashed on an old Stimpy weeping-and-chewing scene? Wish I remembered the episode. @Geo, re: not having any cake… That’s why I always keep a box or two of Jiffy cake mix in the pantry, for those emergencies. Thanks for the mention, Chris! And so the shoe drops. And boy does it hurt.